Grow your business by providing outstanding online reputation services to your clients. BirdEye's partnerships are founded on trust and fueled by decades of industry experience. 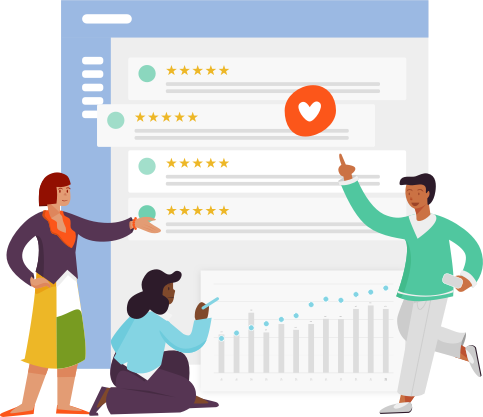 Manage reviews, social media, and surveys all in one place. BirdEye's API integrates with 1000+ CRMs so you can deliver results easier and faster. BirdEye enhances your SEO and SEM solutions to increase your revenue per client and improve client retention. With new features added every week, BirdEye helps you achieve success that you can sustain. With a quick overview of the reports page, you can understand how all your clients are doing. Analyze metrics based on properties tailored to your workflow. BirdEye continues to make significant investments in enablement, training, programs, and support to ensure the success of the partners community. As a BirdEye partner, you benefit from preferred pricing and aggressive discounts to reward your continued growth. Expand your offering by complementing your full-service package with top-tier reputation management tools. Earn a competitive edge and increase revenue per client. Deliver meaningful results quickly with our powerful enterprise-grade platform, designed to support your largest clients. from startups to Fortune 500s, that fuel their growth with BirdEye. BirdEye is integrated with 1000+ apps to automate Customer Experience at every touchpoint.